Game Product Key Finder recovers product keys for thousands of popular games installed on your local or remote network computers, including Electronic Arts, PopCap and GameHouse Games and more. Game Product Key Finder - Recover thousands of popular games product keys instantly! 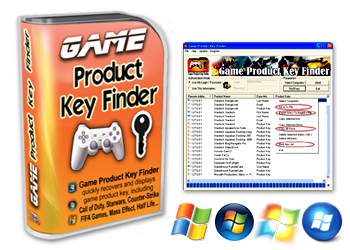 Game Product Key Finder recovers product keys for thousands of popular games, including Electronic Arts, PopCap, GameHouse Games and more. Game Product Key Finder recovers product keys for games installed on your local or remote network computers and allows track the number of games software licenses installed in your network computers. With Game Product Key Finder you can recover lost product keys for all major game software, prevent losing your investment and money! Game Product Key Finder is the easiest to use toolkit on the market. "Thank you for creating such a nice tool. Game Product Key Finder saved me time and money. It was easy and fast. Thanks a lot..."
"Your software Game Product Key Finder has been awarded by our editors Great job, we're really impressed! "I have run a scan on my network using Game Product Key Finder and am happy with the results"
"Thank you for your Game Product Key Finder software. Using it we were able to resolve our problems"